How do you make a great PowerPoint presentation? The secret: sometimes not to use PowerPoint. The more senior you are, the less likely you are to use PowerPoint. 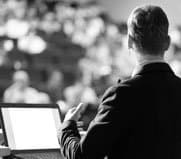 And presenting without PowerPoint is a real practical skill – it saves you time and effort and is better for your audience. If you can plan your presentation without PowerPoint then you can use PowerPoint presentations more effectively. The secret behind any great talk is to use messages that resonate with your audience, a clear presentation structure and powerful language. Then, with powerful delivery, you will find it easier to make a real impact. All this can be done before you start writing any PowerPoint. By learning how to prepare a presentation without using slides you will save time. This style of presenting is faster to prepare, is easier for you and your audience and makes you look much more impressive. Work with our experienced presentation experts to achieve exactly what you need. Benefit from fast, short training sessions, delivering immediate benefits. Whether you need 1:1 coaching for a specific event, or group training programmes to build team skills, we can help. That’s why some of Europe’s best companies rely on us. Why Use BBA for PowerPoint Training? Like this, you build the skills and confidence you need to create and deliver successful PowerPoint presentations of all types. What’s Different About BBA’s PowerPoint Training? At BBA we focus on every aspect of your PowerPoint presentation: how you prepare; your words; how you structure your presentation, your materials (if any) and how you connect with the audience. The advice you receive increases your understanding, strengthens your skills and builds your confidence. You learn how easy it is to be a powerful communicator – when you use the right tools. All our training is tailored to your exact needs. We get to understand you and what you want to achieve. Our most popular sessions last either a half-day or a full day. We typically run this in-house at your offices; either 1:1 or in small groups. But, if you want a powerful talk for 1000, a longer programme or an intensive one hour 1:1 over Skype to polish your PowerPoint presentation, we can probably help. Currently we don’t run ‘open’ courses.